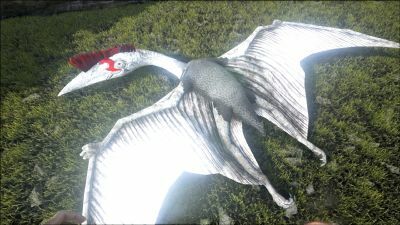 The Quetzalcoatlus (k‬et-sull-ko-at-luss), or more commonly known as Quetzal, is one of the creatures in ARK: Survival Evolved. The Quetzal is constantly flying and flees if attacked. In casual flight, Quetzal tends to fly somewhat slowly. However, if startled, they can move at surprisingly fast speeds — comparable to that of a pteranodon's sprint — in an attempt to escape. After a few seconds it will resume normal speed. Quetzalcoatlus is the largest flying animal yet found on the island. A gigantic, long-necked crested pterosaur, it dwarfs the much more common Pteranodon. These creatures are solitary and far-ranging, flying all over the map to roost and feed. They are carnivorous, feeding mainly on fish and small game taken from the ground. In addition, they scavenge. This section displays the Quetzal's natural colors and regions. For demonstration, the regions below are colored red over an albino Quetzal. The colored squares shown underneath each region's description are the colors that the Quetzal will randomly spawn with to provide an overall range of its natural color scheme. Hover your cursor over a color to display its name and ID. For example, "cheat SetTargetDinoColor 0 6" would color the Quetzal's "wing membrane" magenta. For example, "cheat SetTargetDinoColor 0 6" would color the Quetzal's "wing highlights" magenta. A wild Quetzal never stops flying, so knocking one unconscious solo is very difficult if you do not already have access to a tamed Quetzal. Naturally, if you already have a first Quetzal, the second is quite easy - see the "Quetzal Cage Strategy" below. If you don't already have access to a tamed Quetzal, the following strategies may be of use. Be sure not to knock out the Quetzal above water or it could drown. The 50/50 glitch is a well-known and highly impactful bug that effect the Quetzal. This particular bug makes any startled Quetzal (meaning, one you were about to tame) travel to coordinates 50, 50 on any map. While this path is interrupted by the erratic circling and looping of the Quetzal's typical escape routine, the Quetzal eventually arrives at 50, 50 and will wander around from that area until brought down to tame or scared back again. It will likely not leave the 50, 50 area simply due to its slow, idle flying and tendency to not fly very far in any one direction for a surprising amount of time. 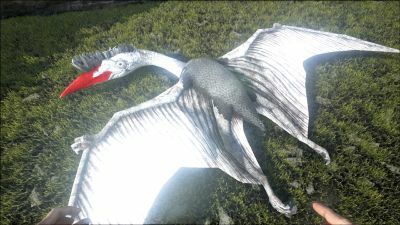 This can pose problems for taming: the Island's 50, 50 is especially dangerous with a host of large carnivores (Rexes, Spinos, Terror Birds, and Purlovias, to name a few) crawling around that general area and Ragnarok's 50, 50 is surrounded by a mountainous, frigid area with high, rocky slopes where the Quetzal can get stuck while escaping, thus not reaching the 50, 50 at all. While a slope-stuck Quetzal makes taming a lot easier, when knocked out, it drops significantly down the slope and there might be predators below waiting for an easy meal. Take careful note of this as you work with the taming strategies for a first Quetzal mentioned below. Using a Longneck Rifle, Shocking Tranquilizer Darts and a fast flying mount. Wait until a Quetzal flies close to a mountain or to the ground, land and then quickly shoot it with the darts. When it takes off in panic jump back on your mount and follow it, and repeat this process until its gets knocked unconscious. While this is a fairly basic strategy, it can be very time consuming, expensive (Tranquilizer Darts require Simple Rifle Ammo to make, which are the second most expensive ammo in the game to make themselves) and potentially dangerous as you must land nearly immediately in order to keep up with the Quetzal's torpor. In addition to this, you will have little control over where it lands, possibly putting it in the way of predators. Be careful that nothing attacks the Quetzal while it's unconscious. For this method all you need is a Tapejara as well as Longneck Rifle with Tranquilizer Darts or a Crossbow with Tranquilizer Arrows. Board the drivers seat to fly and find a Quetzal. Once found, find a place to land and board the front seat of the Tapejara Saddle. 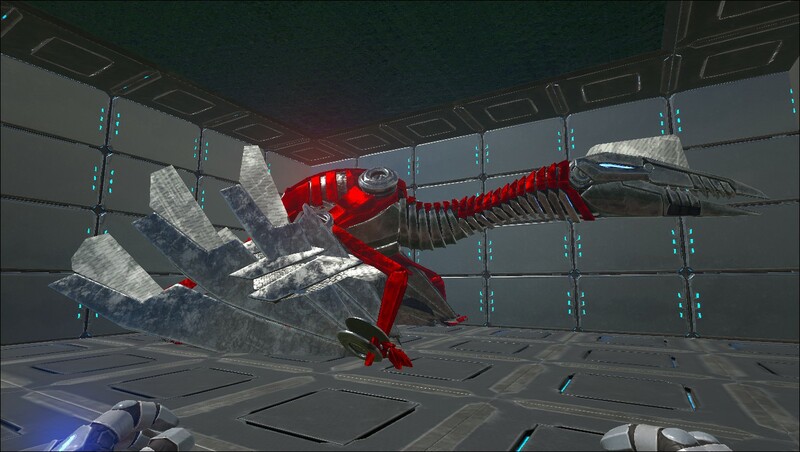 Once in the front seat you will be able to control the Tapejara with whistle commands allowing you to follow the Quetzal while also using a weapon to knock it out. Here is a video showing how this is done. All you need is a tribemate, a Tapejara, and a method of tranquilizing. Put many points into Stamina to maximize the time available before you're forced to land. Make sure you have some Raw Meat on the Tapejara as well. 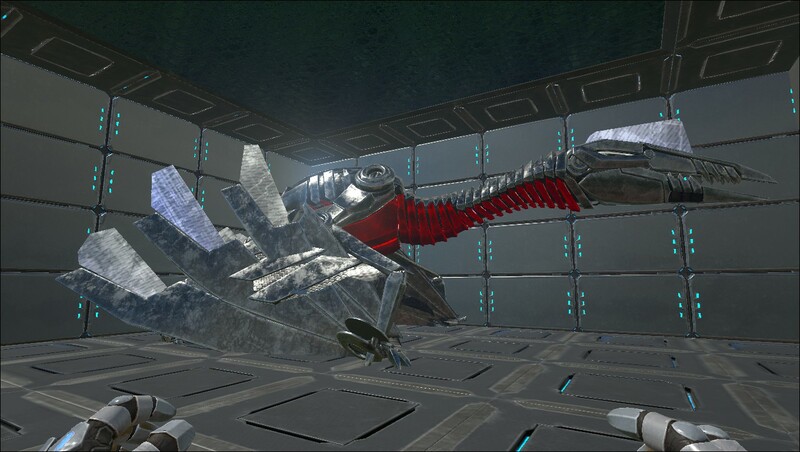 Get your tribemate to mount onto the back part of a Tapejara Saddle and equip your method of tranquilizing (e.g. Longneck Rifle with Tranquilizer Darts or a Crossbow with Tranquilizer Arrows). When you find the Quetzal, fly ahead but still in range and get your tribemate to open fire on it. Once the Quetzal is unconscious, you and your tribemate can protect it, or one of you can bring another dino to protect it, since Quetzals generally spawn in dangerous, rough areas. This method is excellent to tame a low level Quetzal. 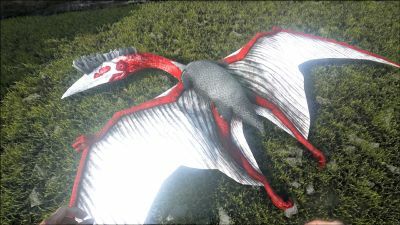 To solo tame a Quetzal with an Argentavis, you need an Argentavis with a saddle, a Grappling Hook, a Longneck Rifle with Tranquilizer Darts, a Parachute and the taming food. When you find a Quetzal, jump off the Argentavis with the Parachute and quickly grapple at the Argentavis. Pull yourself closer to the Argent. Use the "Attack This Target" whistle (Bound to .) on the Quetzal. The Argentavis will start chasing the Quetzal. Now you can shoot it with your Rifle. When the Argentavis is too close to the Quetzal (so it damages it), use the "Move To" whistle (Bound to ,) on the Quetzal. When it moves further away, use the "Attack This Target" whistle again. You can fire a weapon while flying a Griffin and simultaneously move the griffin. This, along with the fact that the Griffin can easily keep up with a sprinting quetzal, has simplified solo taming a Quetzal tremendously as you just have to follow behind it and use a longneck/crossbow. Even when not solo, the Griffin is a good creature to use due to its ability to carry two additional passengers, one on its back and one in its claws, and allowing all three riders to use weapons. Set the Wyvern to follow you and mount it. With the wyvern set to follow, you can stand on its upper back and neck while dismounting in the air, and it will not seek for a spot to land if it is following the player riding it. This allows you to follow a quetzal in the air and fire a longneck/crossbow at your leisure. While the riding area and its neck (even the head, but be careful) can be stood on safely while the wyvern is in flight, death by falling is still a possible danger, so bringing a parachute is recommended. While other mounts like the tapejara are able to keep up with fleeing quetzals during taming, the wyvern is very easily capable of outpacing the quetzal; combine this with the wyvern's wide turn radius and it can make lining up your shots rather difficult without practice: flying past your target while dismounting to shoot or having to double back because the quetzal itself made a sharp turn is more than likely to happen. While the speed and wide turns can make tranquilizing difficult, that very speed however makes wyverns especially useful in searching for quetzals, as they can cover a large area of the map in a short amount of time; vastly cutting down how long you spend on the hunt. 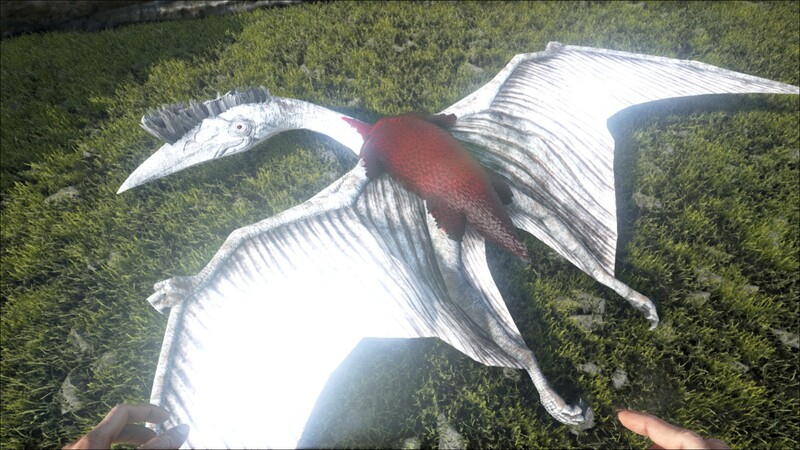 Once the quetzal is unconscious, the wyvern has another use in being a capable defender: able to hold its own with other large predators that may attempt to kill your tame, but be careful, as the wyvern's attacks can easily hit the quetzal you are trying to protect. Take a stack of Parachutes, a Longneck Rifle with Tranquilizer Darts, and a flying mount set to follow. When you find a Quetzal, fly above it and jump off your mount, activating your parachute on the way down. Hit it with as many shots as you can until it is out of range, then get back on your mount and follow it. If you activate the parachute immediately after jumping, you will fall slowly enough to remount in the air. Repeat the process until the Quetzal is knocked out. You can make this process easier by bringing a large pack of Dimorphodons. Load up the mount with materials to craft extra parachutes, and load up the Dimorphodons with Narcotics. Set the mount to follow you, set the Dimorphodons to follow the mount, and set all the pets to passive. Once the Quetzal is unconscious, you can use the Dimorphodons to protect it from predators and to hunt for meat to tame it. Another solo tactic is to use an Argentavis and a very high damage Scorpion for high Torpor. 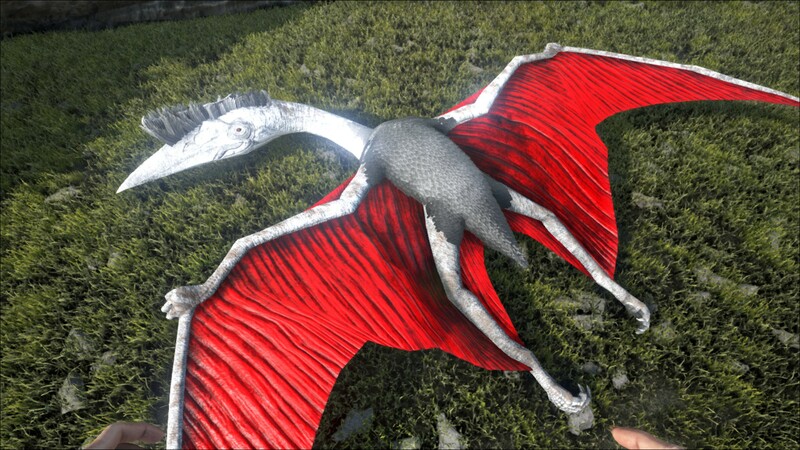 Make sure your Scorpion is set to 'Attack my Target', then using the Argentavis, pick it up and go find a Quetzal. Using a Spyglass, whistle the attack command on the Quetzal and then fly near it, on its right side, making sure your Scorpion gets near its neck; it should attack the Quetzal, stop and wait 10 seconds for the poison to take effect then repeat. Quetzals are faster than Argentavises by default, so sometimes it's easier to wait for it to calm down, which can be around 10 seconds. This method can be very time consuming, especially with higher level Quetzals (a level 16 has ~3400 Torpor) and because of stamina limits. The Pachys basic attack is weak with only 10 base damage, but its Torpor scales 1:1, so a Pachy with 200% melee would deal ~20 Damage and ~20 Torpor. A level 16 Quetzal has roughly ~3400 Torpor, so you'd have to hit it 170-200 times and that's also 3400 to 4000 damage. Even though Quetzals have very high HP, it's a lot more dangerous method of taming since HP varies, although a lot faster if the Quetzal is tanky enough and your Argentavis can keep up with it. Since Patch 256, the Quetzal does not regen stamina in the air anymore. If you're the admin of your server (or you're playing in solo) the way to allow the Quetzal to regen when you are on his back is the command (must be used in game) ?AllowFlyingStaminaRecovery=true. Note that the developers have indicated this could be a temporary command. Without this command, you will have more difficulty taming in the air. Force feeding a Quetzal stimberries or custom recipes while in the air can allow it to regen stamina it would have gotten passively in the past, but stimberries aren't very effective individually and so this will require hundreds or thousands of stimberries to keep the Quetzal in the air long enough. It is best to use a custom recipe of stimberries or rare mushrooms made with a high crafting skill. However, despite the developer's past nerfs to some elements of this method, it's still doable. A Quetzal can be used to capture and tame a second Quetzal very easily. Build a 3x3x3 box made of doorways and your ceiling of any material on a Quetzal platform. Because is it not actually possible to build a complete cube on top of a Quetzal platform saddle with default configs as they limit how many structures can be on platform saddles, you will need to build a relatively minimal cage shape. Be sure there are no open slots more than one space both wide and tall (that is to say, holes that are three spaces high and one wide still keep wild Quetzals imprisoned within the cage, for example, but 2x2 holes may not). Fly to the wild Quetzal and position it inside the box. Dismount quickly and your tamed Quetzal will immediately stop moving. The wild Quetzal can no longer clip through the walls so it will be trapped. 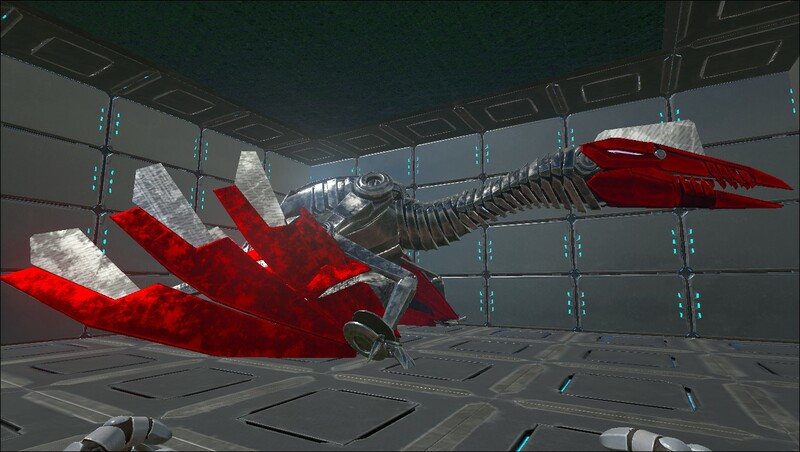 You can now easily position yourself around the wild Quetzal to fire through the slots or doorways at its head (which will most likely be outside the cage) as needed for a few well-placed headshots as the captured Quetzal tries to escape in vain. Once knocked out, the wild Quetzal will fall onto the platform saddle. Do not move your tamed bird or the wild one will fall through the platform to the ground, which is usually much less safe than taming in the air. This strategy can be seen in a video. The rest of the tame proceeds as normal, with the added bonus of having less to worry about than the usual tame except for potentially creating a more visible target for enemy players to see than a collapsed Quetzal on the ground would provide. This solo method requires an Argentavis and a Grappling Hook (a Parachute is also recommended, but not necessary). Pull out your Grappling Hook and shoot your Argentavis in the chest. Whistle Attack this Target on the Quetz and open up the parachute when in the air. Shoot the Quetzal while the Argentavis chases it. Be sure to use whistle passive when the Argent is near the Quetzal and whistle attack this target on the Quetzal when shot. Once the Quetzal is down, switch to the Grappling Hook and pull yourself towards your Argentavis so you can get down safely. Do not shoot your Argentavis too much by accident! If it falls asleep, you will lose your tame and will most likely fall to your death. As a team, one player can pilot an Argentavis or Quetzal with multiple players dangling by grappling hooks, allowing for more players to shoot at once. Works best with 3+ players and Argy with 600+ carry weight. Note that this can cause the server to lag (due to grappling hook physics), so it is not recommended with more than 7 players. Have a Friend hop on a tamed Argentavis, then grab you with it using ALT-Fire. Have your friend fly you around until you find a Quetzal, the shoot it until it falls unconscious. 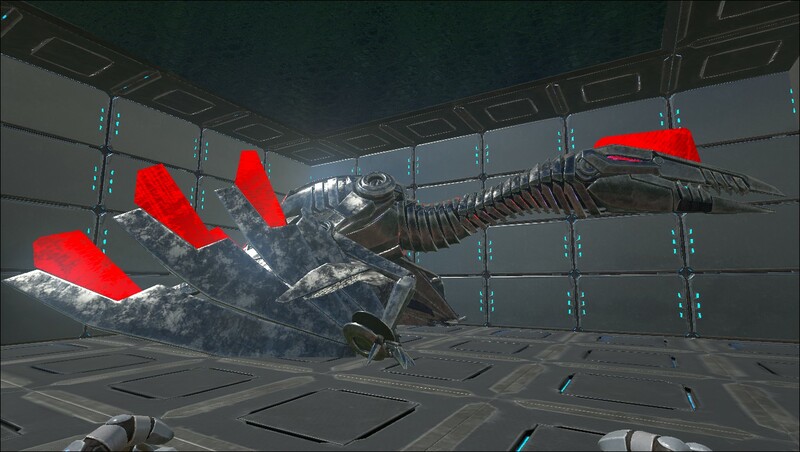 Using the Chain Bola from the Ballista Turret will immobilize the Quetzal and bring it to the ground temporarily. Once stuck, the Quetzal can be pelted with Tranquilizer arrows or darts until it begins to move again or is knocked unconscious. If the Ballista is mounted on a tamed quetzal, it can follow the wild one if it runs. Ground-mounted ballistas must be strategically placed to both hit the Quetzal initially and then cover it when it tries to escape. By using a high stamina snow owl, one may fly directly above and slightly in front of the Quetzal and use the Right-Mouse ability to freeze yourself. By doing this you should collide with the Quetzal and it should freeze and fall to the ground. Your Snow Owl will look frozen but can fly, when you start falling, jump to start flying as not doing so will cause your owl to take fall damage and die. When the Quetzal unfreezes it should walk for a bit and take off after a while, after this it will fly at a low altitude. Rinse and repeat as you see fit. Note- A panicked Quetzal briefly flys faster than the owl. When in pursuit, dive down to pick up speed and pull up towards the Quetzal. 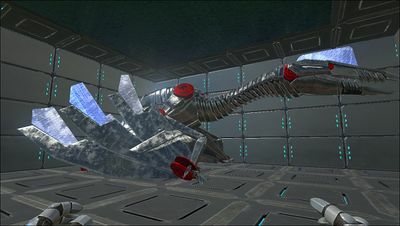 An alternative strategy is to use the ice crash until both hit the ground (frozen creatures do not take fall damage), place some standard dinosaur gates on top of the quetzal in a triangle around the main body and neck while holding the freeze ability on. This traps the quetzal and makes for an easy tame, so tranquilize away. Just hope the quetzal has landed some where safe or it could be lunch for some carnivores. This section describes how to fight against the Quetzal. Due to a Quetzal’s skittish nature, they flee upon being attacked, and never fight back. It is a matter of a fast flying tame and a ranged weapon to put the beast down. However, the Quetzal is so rare and valuable that tribes never even consider killing one. In actuality, there are often battles for their tame, as a Quetzal is an extremely versatile mount that can turn an up-and-coming tribe into a powerhouse. Finding them is a challenge, as they are very rare animals, flying high up in the sky. They rarely approach the ground, so any approaches are airborne assaults. To tame, there are many different methods, as seen above in K.O. Strategy. Refer to those notes on how to tame the Quetzal. Using powerful Tranq Darts from a Longneck Rifle is the best way to knock them out of the sky for taming, no matter what method you use. 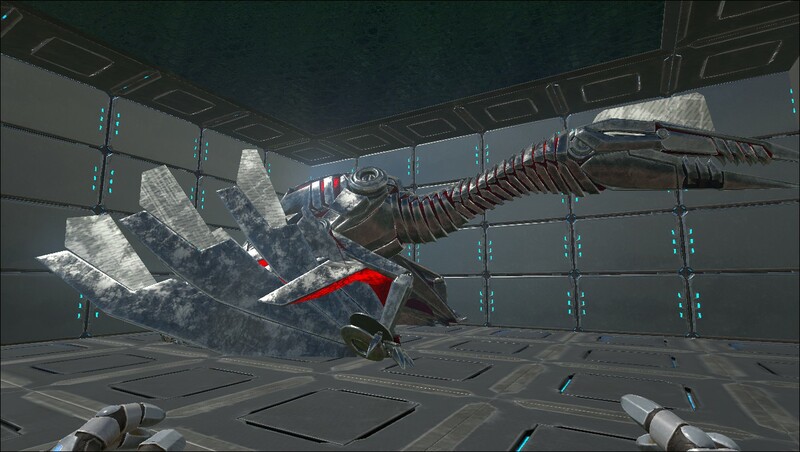 In a PVP battle, use powerful weaponry like turrets to bring an enemy Quetzal down. A concentrated hail of minigun bullets can shred a low-level Quetzal in seconds, aiming for its Crest is counted as headshot. The crest(or hair) is the weakest spot on the Quetzal which means it's the most effective, but it's hardest to hit. They rarely become stuck in mountains or trees. 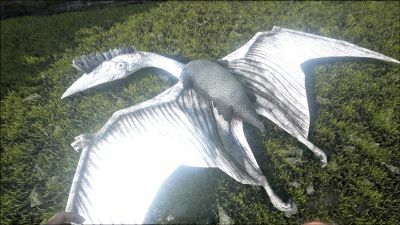 The Quetzal can be equipped with a platform saddle similar to the Brontosaurus, Paracer, Plesiosaur, and Mosasaur and then used as a mobile airborne base. Battle Bird: A great tame to take into big battles and raids. The great amount of health and stamina a Quetzal possesses, armed with fellow tribe members and turrets on its platform, can make for great aerial assaults. However, watch out for opposing tribes shooting your Battle Bird with tranqs. (Health (recommended 10,000+), Stamina (recommended 3,000+) and Damage). Thatch Gatherer: While not being able to gather thatch by itself, the Quetzal can carry a Gigantopithecus which a tribe member could ride while being carried. One flies the bird, while the other one knocks down trees with the Gigantopithecus. This method requires precision flying from the pilot as you need to be close to the trees. Keep in mind that when using this strategy, the Gigantopithecus' weight doesn't matter. However thatch is light so you will get more than enough with base weight on a level 1 Quetzal. Note: This method can't be used for mining stones with a Doedicurus since a Doedicurus can't attack when it's picked up by a Quetzal. Fishing Mount: The Quetzal's long beak is designed to reach down into the water from above and does so, allowing it to harvest substantial amounts of fish. Can also kill wild Sarcos; as long as they can't climb out of the water, they can't attack it. Do not attempt this against a Spino. Hunting Platform: When you dismount, even on a non-platform saddle, you simply stand up on the Quetzal's back, from which you can fire ranged weapons; firearms work best because you don't have to worry about projectile drop at the long ranges involved. Using this tactic is highly dangerous against hostile survivors; it will be much easier for them to shoot the Quetzal than for you to shoot them, and they don't have to kill it. All they have to do is hit it, and it is very likely to throw you from your position on its back as it bucks in surprise and tries to flee, so if you want to shoot at hostile tribes, have a friend fly the Quetzal. Also check for Titanomyrma soldiers, Meganeura, and hostile Dimorphodons before standing up as they can do the same thing. Bring a parachute. Also, the Quetzal is surprisingly useful in a direct fight against wild dinos despite what the dossier says. Moderate DPS is countered by high tanking and knockback; the long beak allows it to fly above many opponents' attacks and still strike downward at them, and the slower speed actually makes it easier to strike at enemies (without overshooting) than other flying mounts... and while it's "slower" than other flying mounts, it's still faster than almost anything on the ground. Multiplayer Transport: With high stamina, a Quetzal with a platform saddle can help other tribemates across the island who have flyers, as they can land on the saddle to regain stamina. Titanosaur Taming Mount: Because Titanosaurs can only be knocked out with the help of turret weapons, a Quetz with turrets on its platform saddle is the most feasible method of taming them. While Paracers and Brontos can also mount turrets, they can be too slow to keep up with the Titanosaur, and too low to the ground to have turret weapons reliably hit the head. Furthermore, a mount that can't outrun the Titanosaur is at high risk of being killed. However, with standard vanilla settings turrets can no longer be built on platforms. Will only move forward upon command. With no forward command issued they eventually halt and hover in mid-air. Even while not moving, a Quetzal expends a small bit of stamina just to stay aloft. Feeding Stimberry or Stimulant to a Quetzal in-flight can allow you to fly for longer periods, but the stamina gain is minor at best and very inefficient. However, if you have a good berry collecting dino, you can collect Stimberries in bulk, then feed it a lot at a time. Landing is accomplished by pressing the jump key (default space / ), causing the mount to move to the ground and land, where your Quetzal folds its wings. Now you can dismount by pressing use (default e) as with any other mount or walk on the ground. To start off again, press the jump key (default space / ). However, the Quetzal sometimes falls when pressing space while high above the ground, as if it had been walked off a ledge. It is therefore advisable to get close to the ground before trying to land. Note: A tamed Quetzal with no rider will not lose stamina while sprinting to keep up with a player running or riding another dino. - You can use this quirk to carry large amounts of weight quickly with a Quetzal set to follow. In PVE the Quetzal is only able to carry personal or tribe-owned creatures. Note: Dismounting while carrying a creature releases them. Fixed Fleeing behavior that would cause creatures to head towards the origin (50,50). The Dossier was revealed on 06/17/15 on Steam. Quetzalcoatlus conchapicem roughly translates to "Feathered lizard god that carries fish". This is a reference both to its name's origin as an Aztec god and to its in-game usage as a carrier as well as its diet of fish. In the real world, Quetzalcoatlus is the largest known flying animal of all time, and more recent estimates place its wingspan at 10–11 meters (33–36 ft). It can carry up to 40 structures on its Platform Saddle (including windows, doors etc.). Unlike the Argentavis or Pteranodon, the Quetzal cannot angle upwards or downwards. In real life, Quetzalcoatlus spent most of its life walking on land, hunting like a giant stork. It probably attacked every animal it could swallow. It was big enough to gulp down a whole grown man. Often attempts to travel to 50 latitude - 50 longitude (on both Center and Island maps) when you attempt to knock it out. This should have been fixed in 236.6 but it still seems the case. This is known as the 50, 50 glitch, mentioned above. ↑ Jat (17 June 2015). "Introducing the Quetzalcoatlus!". Announcements. ARK: Survival Evolved Steam Community. Retrieved September 17, 2015. This page was last edited on 31 March 2019, at 22:30.